Suzuki alone amongst the major manufacturers appear to have been the first to believe in adequate, controllable braking being preferable to the old 'squeeze and hope' type brakes. 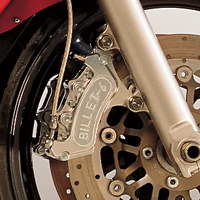 All their large Sportsbikes now feature 6 piston Calipers. You own a GSXR750, GSXR1100 or a TL1000S and you want to move with the times? We can supply direct fitting mini-6 Calipers for around half the price of Suzuki parts. Intruder VS1400s have but one front brake, change to a mini-6 and the braking becomes useful. GS1000s can now have non-seizing, superb progressive braking 4 piston Calipers, and at a realistic cost.